Eualcides was a real man—the commander of the Euboean allies at Sardis. He died there, and his death was worthy of mention fifty years later by Herodotus—making him a man of some prominence. I chose to interpret him as typical of a class of aristocratic men—professional warriors, adventurers, occasionally pirates or merchants by turns. He lives to emulate Achilles in generosity and in feats of arms. In life and in death, his actions have consequences on all those around him—that was (and is) the life of a hero. Euboea is (just barely) an island off the coast of Greece, separated by so little that the nearest point was bridged even in ancient times. Rich and fertile, with easy access to the sea, Euboea cities like Chalkis and Eretria were the first Greek cities to rival Phoenicia and attempt both eastern and western trade in the Mediterranean. 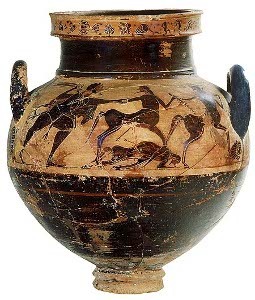 Contemporary archaeology and interpretation of texts like Hesiod have opened new appreciation of the role of Euboea in Archaic Greece. I strongly recommend Travelling Heroes by Robin Lane Fox, which was my first window onto Archaic Euboea.